Apartment buildings can be home to hundreds of people and may come equipped with buzzers, ID-enabled entry systems, or security. But those features may result in a false sense of security, DeeDee Dalton, managing director of the National Crime Prevention Council (NCPC), says. After all, apartment buildings have multiple entry points and several strangers coming and going, from service people to residents' friends. So, it can be easy for burglars to gain access and blend in, she says. And when they do, they're quick. "Most burglars want to be in and out in just a few minutes." Locking up may seem obvious, but 60% of all successful, residential robberies happen through unlocked doors and windows, the NCPC says. Be sure to lock the door to your apartment, whether you're at home or away, Dalton advises, and ask your landlord to install deadbolt locks (and a peephole in your front door). Remember to keep your windows locked too, especially if you live on the ground floor or in the basement. And if you have sliding glass doors, invest in a dowel or steel bar you can slide into the door track for added security. Upon moving in, request a lock change, and monitor your spare keys. Whenever possible, avoid giving keys to anyone doing maintenance or renovation work in your home, Dalton says. And don't let workers or other strangers into your apartment if you or someone you trust isn't present. Getting to know your neighbors allows you to watch out for one another's apartments. If you're going out of town, hold your mail, and have friends or a trusted neighbor check on your apartment while you're away. Consider joining or organizing a watch group so that neighbors in your building can look out for and help one another. "Lighting is one of the best deterrents to nighttime burglary," Dalton says. When you're away for long stretches, consider using a timer to turn inside lights on and off. "This is where smart-home tech comes in handy, as smart light bulbs can be programmed and turned off and on from afar with a smartphone app," Emily Long, a home-security expert, says. 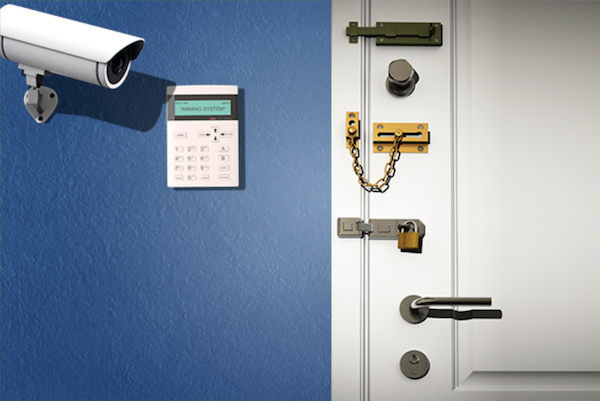 A wireless security system could be appealing as a renter. The system is more portable than an installed system, and your lease may prohibit you from drilling into walls and hooking up wires. "They are often simple and easy to set up yourself and are available in basic packages for smaller spaces," Long says. "Look for a system with 24/7 monitoring, which will alert help if suspicious activity or any type of emergency is detected." Similarly, you can set up security cameras that you can monitor via smartphone. This way, you can alert the authorities when something triggers them. Plus, having a security system could help save you money on renters insurance. If your building has a doorman or a front desk staff, be sure there's a system to log visitors as they come in (if not, suggest it). If there's no staff, ask to have a security camera installed in the lobby. Having these measures in place may help deter burglars, Long says. "Plus, the more security measures a building has in place, the more information tenants and landlords have available in case something happens." Put cash, checkbooks, credit cards, jewelry, and other valuables in a safe place, and store your laptop or tablet out of sight. "There are a number of clever options for discreet storage, like faux wall outlets, vents, and even cereal boxes," Long says. But the simplest option is a home-safe that bolts to a floor or wall—perhaps in a closet, she advises. If you're on the ground or first floor, installing curtains or blinds could prevent burglars from peering in to scope out your space. "If windows are easily visible from the outside, close the blinds," Long advises. "For windows that are less visible or on higher floors, leave the blinds open to allow timed lights to shine through." Always be aware of solicitors and delivery people lingering in your building. Note suspicious behavior, and alert the police and your landlord or management right away, Dalton says. A renters insurance policy can help give you peace of mind for your most important, personal belongings. Contact the GEICO Insurance Agency for a free quote.